Read about it at the Nest. 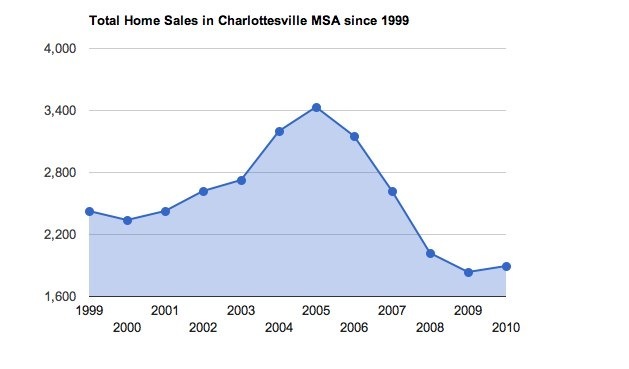 October 2010 marked the 4th straight month that our sales in the Charlottesville MSA were Â down. Â The 9 straight months of month-over-month sales increases is in danger of being completely wiped out. Â And sales in Oct 10 weren’t a little off as compared to Oct 09, they were WAY off. Â October 2009 sales in the Charlottesville MSA (Charlottesville, Albemarle, Fluvanna, Louisa, Greene, and Nelson) totaled 192 sales. Â That tally last month was just 137 â€“ a drop of over 28%. Â After 2 straight months of being just a few sales short, October proved to be the second worst month in the last year (July sales were off a whopping 36%). Seeking “Normal” Volume: (Answer: I’ll let you know what “normal” is when I have the luxury of 24 months of hindsight. A couple caveats when looking at the PDF reports below: Don’t pay much attention to the Average or Average Continuous Days on Market; they are two of the easiest-manipulated numbers in the Charlottesville MLS. Really don’t pay attention to the % Sold to List Price ratio. That’s more manipulatable than the Days on Market. Keep in mind that the following reports are County and City level reports that reflect higher-level market activity and show neither extreme – not the house that went under contract in three weeks for full price or the house that has been on and off the market for four years and has dropped its asking price by 33%. The market is what it is. We just have to roll with it.If you’re thinking about selling your house in the Charlottesville area, get started now. Really, we don’t know what “normal” is. As soon as we find it, I’ll let you know.